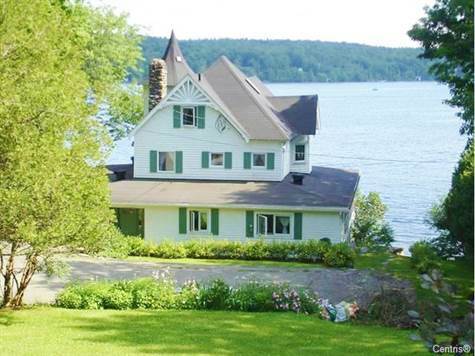 ENCHANTING WATERFRONT PROPERTY WITH TURRET AND "IVORY TOWER" PANORAMIC VIEWS FROM ALL ROOMS, ENGLISH GARDENS, 100' of WATERFRONT WITH LARGE PRIVATE BEACH! ALL THE CHARM OF YESTERYEAR RENOVATED FOR TODAY'S LIVING. SUN-FILLED SPACIOUS ENTERTAINING AREAS. SKIING, GOLF, NEARBY. ALSO FOR RENT - $3,000/month for 12 months.